For a group of school librarians and teachers in Charlottesville, VA, summer doesn’t mean lying out in the sun with a glass of lemonade. 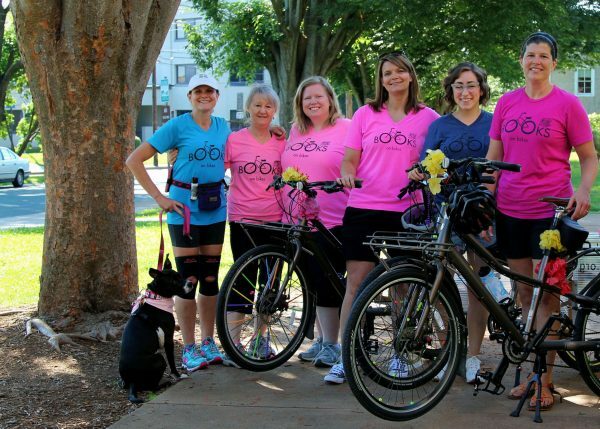 Instead, they are taking to the road with their bikes to provide books to students in the Charlottesville City School District, where 54 percent of the student population is economically disadvantaged. This is the school district’s sixth summer with Books on Bikes, which puts books that children love into their hands so they will remain excited about reading throughout the summer, during the school year, and for the rest of their lives. The Books on Bikes team members held a kickoff parade June 10 and made their first book delivery of the summer on June 12. The idea started with Mary Craig and Rebecca Flowers, elementary school librarians for Charlottesville schools. They began thinking of ways they could deliver books to students who may not have many at home during the summer when school is out. Flowers admits that her lifelong dream was to drive a bookmobile, but Craig more sensibly suggested they ride bikes, since Charlottesville has a large biking community. In the first year, they started small and filled a little red wagon with books to deliver to students in their neighborhoods. “We had so much fun, and the kids we visited were so excited to see us every time,” says Flowers. After the first year, the librarians needed to figure out a way to purchase bikes that could carry a load of books and a cooler full of Popsicles. They considered bike trailers, tricycle-style bikes, and cargo bikes, and they visited local shops to research what type would work best for delivering books, taking into account Charlottesville’s hilly terrain. With the help of Blue Wheel Bikes, they determined that a bike meant to carry large loads of cargo would work the best. But with each one costing about $1,300, their next step was to create a Kickstarter campaign. “We needed a video that would capture an audience, especially an audience willing to donate money to our cause,” explained Flowers. Light House Studio, a local nonprofit organization that teaches students filmmaking, helped the librarians create the perfect Kickstarter video. The film features the organizers talking about the program, while a trail of books falls down like dominos, leading from one of the schools to a nearby neighborhood and into the hands of a student. The Kickstarter campaign raised more than $5,000, enabling the librarians to purchase three bikes. Since then, they have raised funds through grants, local restaurants, private donations, and donation jars at local businesses, allowing them to purchase three additional bikes. The Books on Bikes team has grown to include four librarians—Craig of Clark Elementary School, Flowers of Johnson Elementary School, Sarah Fitzhenry of St. Anne’s-Bellfield School, and Katie Plunkett of Greenbrier Elementary School—teachers Kellie Keyser of Greenbrier and Stacy Diaz of Walker Upper Elementary, and two therapy dogs, Luna and Pina. The entire Charlottesville community supports the program by donating books, most of which are gently used. The local Friends of the Library organization at the Jefferson Madison Regional Library supplies many of the titles, with authors, publishers, and distributors also contributing works to the program. “Since we are librarians and the children we visit are our students, we already have a familiarity with books that are popular in our libraries and classrooms,” says Flowers. They bring a wide variety that they know children love. When children ask for a specific book or genre, the team makes sure to add it to the bike on their next visit to that neighborhood. In 2015, Diaz introduced Luna, one of the therapy dogs, to the program. Having Luna along offered multiple benefits to the students. Many have either not been around dogs or have had bad experiences with dogs. Working with a therapy dog helps them calm down and learn to enjoy being around an animal, she says. “We work on how to safely approach and pet a dog, so children have skills that will keep them safe,” she explains. “Working with a dog forms a connection and works on social skills and empathy. Many of our students have poor capacities at these with humans, and I have seen how introducing a dog really helps them gain ground on these fronts.” Therapy dogs are also great listeners when children read aloud to them. Research has shown that struggling readers are more apt to read to a dog than to a human and that this experience builds fluency. Books on Bikes exists throughout the country, including programs in Seattle and Sheboygan, WI. Those interested in starting their own program can find some helpful hints here. Begin by connecting with local organizations, businesses, and local public library. Next, explore fundraising and grant options. Then get rolling!